CRAP == calorie-rich and processed. However, for anybody who's regularly reading ingredient lists of food they buy, there is one other additive that makes it into virtually every item of processed food and also contains a big share of calories which very quickly get turned into sugar by your intestines. That third thing is starch, mostly in the form of refined wheat flour with ever more of that being replaced by corn starch recently. The nutritional value of starch is just as low as it is for sugar, and the sugar-high provided from starch is just as real as that from simple sugars, only that it's spread out a little more. As you can see in the diagram, added fats make up the largest source of standard American Calories, but the close runner-up is "grains". Now –I thought– most of those grains are consumed as bread, pasta, pizza (dough), cake, pastries, (all made mostly of refined flour) and of course, lot's of starch added to almost any other food to make sauces more creamy or doughs stick together better. In other words: most of those "grains" are in fact just "added starch". Shouldn't that be reflected better in the diagram? You can look at the spreadsheet to see which food is grouped where. (Pedantics can check the formulas.) The actual ratio of "added starch" vs "healthy whole-grain" depends a bit on interpretation, but according to the data I think that about 80% added starch and refined flour made from all consumed grains is a fair guess. (Remember that most white breads, doughs, and pasta are 99% starch.) So this much belongs into the CRAP portion of the diagram, because starch and white flour are almost pure calories with little other nutrients. The remaining 20% of grains (and that includes pop corn, for example) goes to the healthy plant foods group. Now, take one more look the diagram. 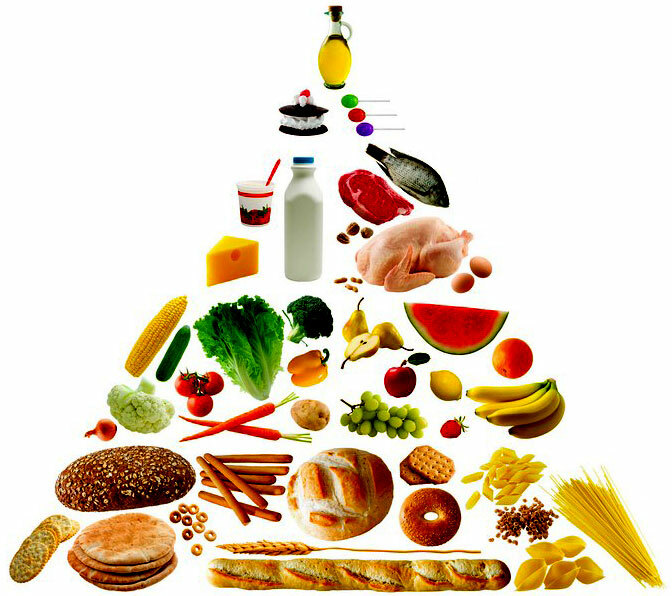 See that large chunk of 60% calorie-rich and processed foods? Any doubts what the Americans mainly consume? Holy CRAP! First of all, eat greens and beans. On top of that, eat fruits and roots. And last not least, eat nuts and seeds. Divide your daily caloric intake about 60/35/5% in the first, second, and third group. Remember that the greens have very little calories per volume, so you'll need to eat a lot. Conversely, nuts and seeds are very dense in calories (especially fats), so you'll only need to sprinkle a few on your salad or blend them into a dressing. Remember, unrefined plant foods (including mushrooms in the first group) are the only foods allowed, so there's no sugar, oil, or flour, or anything made of sugar, oil, or flour anywhere near allowed! 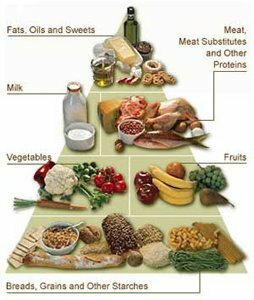 The food pyramid put on its proper base. But as I grew more conscious about what I eat I found that the really interesting and most important stuff in a meal were really the vegetables. 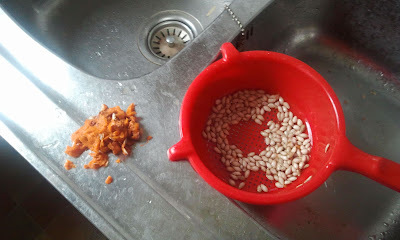 I felt the starches were always kind of the same and boring and what really gives you the most nutrients and also adds most of the flavor and character to a plate are all the other vegetables. During the last months I grew more and more dissatisfied, upset, and in the later stages even angry with the fact that virtually all meals that one can buy outside have this huge starchy base and just not enough really nutritious (and delicious) veggies. Just think of a sandwich with just one leave of lettuce and slices from half a tomato. Or a pizza which is just a hot open sandwich that's still much more dough than veggies on top. Each time after having such a meal I would first feel full and tired (at work, this meant I needed coffee to not fall asleep! ), then be fine for a short while, and then crash into a huge hunger (even greater than before I had eaten!) and sometimes accompanied with symptoms of low blood sugar. Maybe some readers know those shaky legs!? For a while I avoided the problem by eating at the Asian fast food counter where the serving of veggies is big compared to the base of rice, but over time I also felt that there was still way too much white rice on the plate and also too few veggies. Sometimes I still needed coffee and wouldn't be satiated until the next meal time. Something I just learned from the book and appreciated a lot to know is that leaf vegetables (like arugula, spinach, chard, broccoli, and kale) should actually be considered a separate group apart from other veggies because they are so rich in nutrients, especially micro-nutrients and natural fiber. If you think that this pyramid seems weird and unnatural, then that's because the old one is just rooted so deeply in our culture. 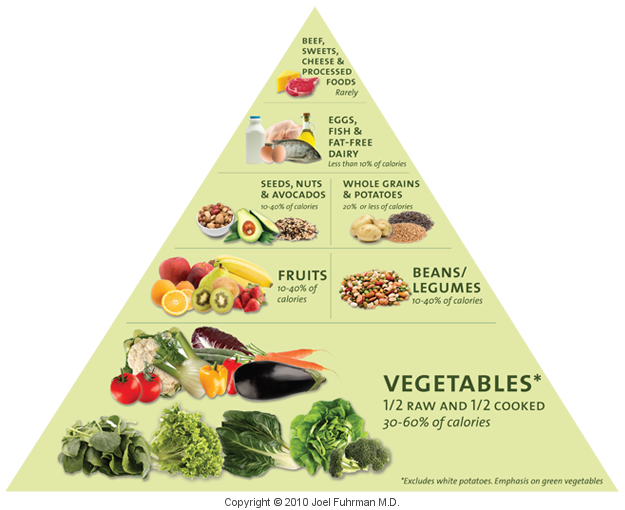 Dr. Fuhrman is not the only person that came up with this new food pyramid. Here are two other respectable sources: the University of Michigan and Dr. Dean Ornish (of TED fame) both promote a plant-based diet to promote health and avoid illness. I'd like to write a lot more about what I learned from the book, and how it's just what I needed in my current crisis – but first I have to make another salad. Pumpkin soup, pumpkin pie, pumpkin bread, pumpkin spread, marinated pumpkin chunks -- there are over hundred different ways to prepare pumpkin, yet there's little prepared pumpkin available at restaurants and grocery stores. Of the top of my head I could name a few restaurants that have pumpkin soup and I've seem pumpkin puree on supermarket shelves, along with awfully sweet, unhealthy pumpkin pie. So how do I get my healthy dose of pumpkin without spending too much time cooking? Just make the simplest of pumpkin recipies (next to raw pumpkin): baked pumpkin parts. 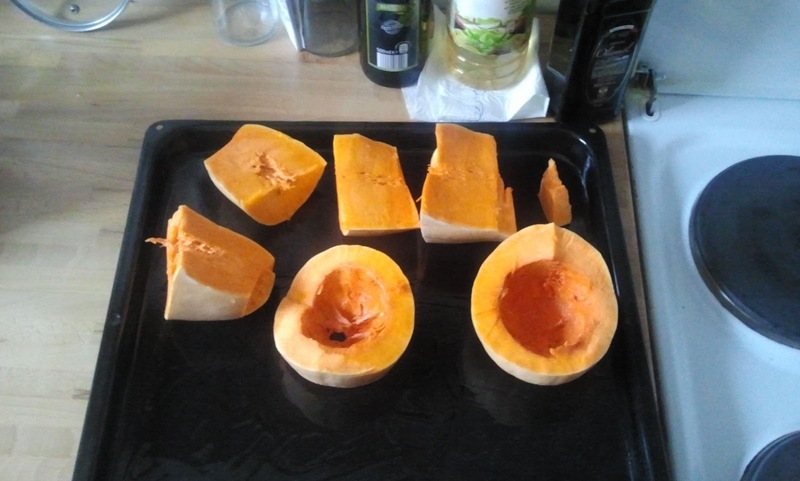 While eating, I found that the pumpkin flesh that was closer to the pan was much more moist and had more taste. While the upper part was good, too, I found it quite dry in comparison. So my plan for next time is to steam the pumpkin parts instead of frying them. I am already looking forward to trying that!